Russell offers a FREE first / introductory lesson! 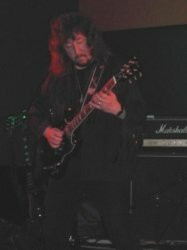 I've been playing guitar for 35 years now and in that time I've done thousands of gigs across the UK and Europe and been a professional guitar teacher for 15 years. I've done session work for Adidas and other companies and appeared on national TV. I currently play in the UK's top Black Sabbath tribute band 'Sack Sabbath' and rock covers act 'Synner' but I've played in many bands over the last three decades from acoustic acts to cabaret style bands! 15 years as a professional guitar teacher at Ilkeston Music School, Blend Youth Project and local schools and colleges. I treat each lesson as it comes, catering the lesson to the desires and requirements of the individual. Lessons can be as loose or as formal as you like, you can simply learn your favourite songs for fun, or do a structured course from the ground up looking at all aspects of playing the instrument, music theory and understanding how instruments and amplifiers/effects work. RussellFrom Emma (5/5): Russell is a great teacher, he's passionate about guitar playing and extremely experienced. He is also very patient and gives good feedback along with homework. Anybody who learns from Russell will be a great guitar player. Reply from: Russell: Thanks very much Emma, appreciated. RussellFrom Jamie (5/5): Excellent tutor, great style and approach. Loves to get stuck in with you which helps build confidence. Reply from: Russell: Thank you very much Jamie, appreciated. You're a pleasure to teach too.